The Dominican Republic, a sun-kissed island glued to Haiti, is fast becoming a hot Carribean getaway. 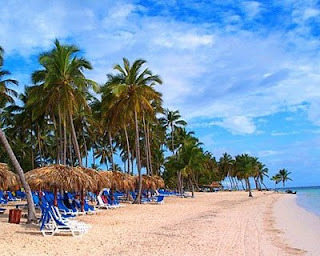 On the southern coast is the bustling metropolis of Santo Domingo; to the east is Punta Cana, a resort hub where cheap all - inclusive tours abound. For unreal eco-adventures, head north to Puerto Plata and Cabarete. SLEEP. Feel free to crash at Maxim Bungalows (maximbungalows.com) at Juan Dolio and Cofresi beach. These breath taking resorts feature 5 star amenities like lavish suites, resort wide wi-fi, and a 17,000 sq. foot spa. You can take a chauffeur-driven SUV to the Carribean's best golf courses or charter Maxim's own 54-foot yacht, Independence, for private open-water parties or stop at Castaway Beach, a secluded nook perfect for snorkeling and barbecuing. DRINK. Locals and tourists alike flock to Punta Cana's Occidental Grand Hotel for Mangu' Disco (800-858-2258), a dance den featuring fire eaters and thumping house music. In Cabarete Beach, you can hang ten with the surfer set at Onno's bar (809-571-0461), then down pina coladas all night at the popular open-air bar Lax (809-710-0569). EAT. Don't leave Santo Domingo until you've tried the sancocho (a hearty stew of meat, sweet potatoes, and cassava root) at El Conuco (809-686-0129). Big night out? Recharge with mango smoothies and burgers at EZE bar & Restaurant in Cabarete Beach (809-880-8779), then dine on ceviche and curried fish at Natura Cabanas (809-858-5822).